Have you ever had something that “everyone” told you to try and you kept putting it off? Maybe because you thought it was dumb, or unnecessary, or that your way worked just fine. But then you finally gave in and tried it, and you were like…WHOA…where has this been all my life? Yeah. That. Here are five things people put off trying or doing. You’ll kick yourself once you realize what you’ve been missing. Isopropyl alcohol is invaluable because it dissolves polymer clay, varnish, and alcohol ink. It is relatively harmless (all alcohol is toxic…yes, even vodka), evaporates quickly, doesn’t leave a residue, and doesn’t have a lingering odor. as part of really nifty surface techniques: play around and try things! While not everyone wants their pieces to have a super glassy and high gloss shine, most everyone wants their pieces to look finished and polished. People will tell you that the best way to do this is to sand and buff. But that seems too much like work (spoiler: it shouldn’t be hard work), so you try coating things with a varnish. But that goes sticky or gets brush strokes. So you try resin, but then you get bubbles, or it pulls away from the edges, and you realize it’s not actually all that smooth. So you give up and always feel a bit guilty that your work isn’t as lovely as it could be. Go back to sanding and buffing. Trust me on this. It’s only hard work if you’re doing it wrong. And most of the advice given out there is way too complicated and hard (that bit about going through all the grits…yeah that). Don’t spend another penny on sealers, glazes, resins, or other shortcuts until you invest in understanding the fundamentals of finishing your piece well. My 120-page Sanding and Buffing eBook does just that. People often come to polymer clay with the intention of making a small figurine that resembles a cartoon character with large, solid areas of a single color. Perhaps because classical sculptors use white, gray, or flesh-colored clay and then paint their creations afterward, these newbies assume that’s the best way forward. But there are problems with doing that. Painting is a very different skill from sculpting, and you’re ramping up the effort (and risk) by asking yourself to take on a second skillset (painting). Painting tiny sculptures is quite tricky, even for a pro. Many high coverage paints usually used for model painting will be sticky on polymer clay, and craft paints give quite poor coverage, leading to many coats and some serious gloppiness. (Hey, it’s a word.) And then, do you add varnish over the paint? That introduces a whole new layer of complexity. Now add in peeling paint, and a simple project becomes a disaster. Instead, use colored clay to make all the parts. Yes, it means you have to buy lots of individual colors. But remember that you can mix colors to create new ones. The colored clay is stronger than the white stuff, too, and any mysterious breakage problems will likely be solved as well. And while we’re on the topic, you don’t need to add any glaze or sealer to your creation. Polymer clay is vinyl and perfectly strong, durable, and waterproof just as it is. If you want it shinier, see above…sanding and buffing is your friend. Speaking of breakage, did you know that breakage is almost always a baking issue? Pros know this and nearly always bake their items for 45 minutes to an hour (or even longer). And yet, discussion of this topic in groups still meets great resistance with people swearing up and down that baking longer makes brittle items or causes burning. Nope. Trust us on this. Get your oven’s temperature correct first, and then bake longer. 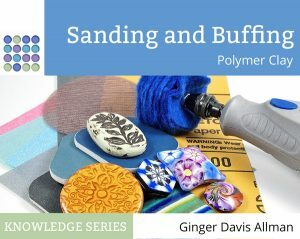 Learn more about baking polymer clay here. And if you’re tempted to believe that baking at a lower temperature is the right way to go to prevent browning, read this article to understand THAT myth. For many years, every time I heard of someone using deli sheets, I rolled my eyes and thought they were just fan-girl crazy, and I was just fine with my plastic wrap. And then someone gave me a box….and…the world CHANGED. Get yo’self some deli sheets!! Plastic deli sheets are perfect for wrapping odd bits of clay, storing sheets or veneers, covering areas of clay, laying down before smoothing seams, separating things, making rounded edges with cutters, setting a sheet down, so it doesn’t stick to anything, and much more. This is the type to get: Plastic Poly Deli Sheets or here’s another one. A box will last forever because you can re-use each sheet many times. Is there anything that you resisted trying for a long time and then found that it changed the game? Tell me about it in the comments. I’ll bet I’m not the only one on this!! People using baby wipes make me laugh. Alcohol a paper towel is much better and cheaper. Not only that, but baby wipes leave lint. I was having a problem with lint from the inexpensive baby wipes I bought. I tried a slightly more expensive name brand and voila! No more lint! Thanks for really interesting and useful info, I love your information. I just want to add UK experience of trying to buy Isopropyl Alcohol, you can buy it, but it is really expensive and the “Chemists” (UK term for a Pharmacy) is not happy about selling it to you and they would have to order in my experience. It did used to be possible to buy it, sporting friends used it on blisters and we non sporty types used it on our newly pieced ears. Why did it get so hard to buy? I heard it is used in the making of illicit drugs!! so be careful. I bought mine on line. I do use it with my alcohol inks. BTW I have had comments about my little scales, that I weigh my clay on to make sure my beads are the same size. Thanks Ginger, yes I bought on line paying around the same price, but the Chemist wanted £25 before he ordered it. I must look like a dodgy character! And small companies wonder why they’re losing out to the big online ones? Geesh. Glad you found some. It’s great stuff. So true ! How often we see and post about these topics , I could not clay with out alcohol or deli sheets ! I recently learned not to clean my acrylic Tools with alcohol. I can make them crack or develop fissures. Maybe not right away but they can show up later. As soon as I stop using it to clean my templates and rollers / brayers stay in perfect shape. And while sanding and buffing is my favorite past time I’ve recently developed the need to quit avoiding resin, Particularly UV resin. Mastered two part resin a long time ago. But the long time for curing it’s really not worth it when you get such a beautiful finish from sanding and buffing. Thanks for the tip about alcohol causing fissures in acrylic tools. My roller has developed a mysterious crack and it very likely came from my using alcohol to clean it. Pleased to see that I am guilty of doing all of these. I would add that using an artist quality soft brush with the alcohol reduces the amount of fingerprints that need to be sanded by a significant margin. Found these baking instructions and was surprised about them saying not to bake longer than recommended. I always bake longer with no problems. Why the contradiction between them and what most everyone else recommend? The instructions on the package are not the optimal conditions for getting the best results. They’re the simplest directions that provide the least complications for the greatest number of consumers. Most ovens are wildly inaccurate, but of course, the manufacturers can’t control that. So those directions give a suitable outcome for most people. Baking for 30 minutes works just fine in most cases. But as we know, there’s quite a bit more to it. It’s a huge topic. I resisted using knitting needles to do smoothing for the longest time. Then I got some and now I’m in love. They are the perfect thing for smoothing out creases and blending. Would love to get some deli sheets, they just don’t seem to have them in Australia. Do use freezer wrap, but even that can be hard to get. I think in Australia there are interleave sheets? Maybe try those. In Australia you can buy Go-Between or cut open freezer bags. Go-between us thicker. I don’t use deli sheets. I use wax paper. It’s way cheaper for me. One thing I resisted was the motor for the machine. I kept going “oh it’s good exercise”. Now that I have it, with my hands going worse and worse I’m so happy that I got it. Another thing was buying a few tiles from the hardware store. I just kept improvising with stuff I had around the kitchen. I think that one thing that many are guilty of is “verify facts”. There are some myths going around the polymer clay world that are really damaging especially for newcomers. Most of the time it’s because “someone posted it on youtube”. Day, do you not have problems with unwanted leaching? I was using wax paper to wrap my canes but found it pulled too much conditioner out of raw canes. My two are to take pictures of my work before baking and using magnifier glasses. They have greatly increased the quality of my work. A picture points out flaws I was not seeing and the magnifier glasses let’s me increase the quality of my work becaus I can see to do things better. Just a couple comments on a fun article. Re deli sheets: they’re great! I got a box of 1000 to use with clay and figured I’d have them forever. Then I found myself using them for other things as well, probably closer to their intended use, such as separating hamburger patties before freezing, putting them on my kitchen and analytical balances before weighing things. I would never have bought them for their “normal” use, but since they’re there . . .
Re baking: add extra time if you’re using a bed of baking soda to support pieces. Baking soda holds a lot of air, and air is a very poor conductor of heat. I resisted a heat gun before my purchase of “Polymer Clay Gemstones: The Art of Deception” by Kim Schlinke and Randee M. Ketzel. Randee and others…most especially Randee…goaded me on on Facebook. Now, I don’t think I could live without it. Your tips on using a custom blended palette of colors instead of paints, varnishes, etc.. has been my primary rule since I found out for myself how inconvenient those products really are. Also, sanding and buffing seemed to me “a waste of time” til I gave it a go. I finally decided parchment paper was the best for me. I use it for curing as well as on top of my marble work surface. I cut it to the sizes I need and wipe it lightly with rubbing alcohol once I’m done so I can reuse it again. One roll becomes quite economical.